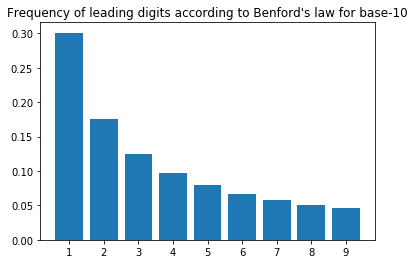 Benford’s law is the observation that in many numerical datasets, the distribution of leading digits is not uniform—the first digit of any number in the dataset is much more likely to be a 1 than a 9 (30.1% vs 4.6% for numbers in base-10). These expected frequencies can be calculated for any base with the formula log_b(1 + 1/d) where b represents the base and d is a digit in [1, b). 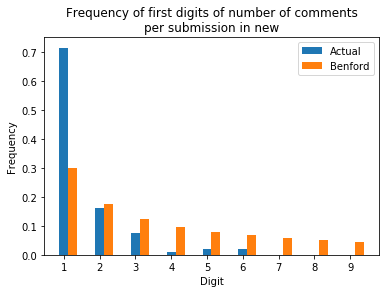 An experiment to test Benford's Law against large, publicly available datasets. In fact, when data instead does not follow Benford’s law, it’s often reason enough to doubt the authenticity of the data. One commonly cited application of Benford’s law is in detecting accounting fraud—if the figures in financial statements aren’t consistent with Benford’s law, they could have been misrepresented. 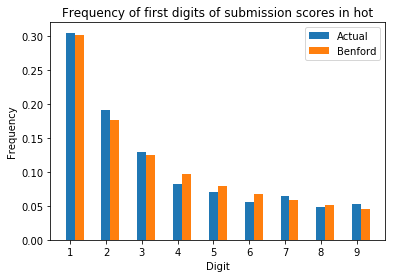 Benford's Law states that, in naturally occurring systems, the frequency of numbers' first digits is not evenly distributed. 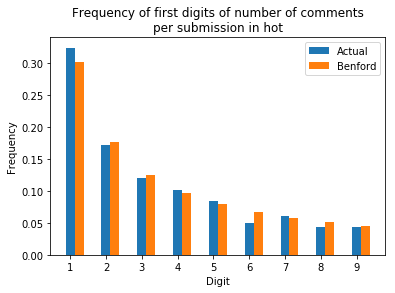 The counterintuitive distribution of digits in certain data sets turns out to be a powerful tool for detecting strange behavior on social networks. 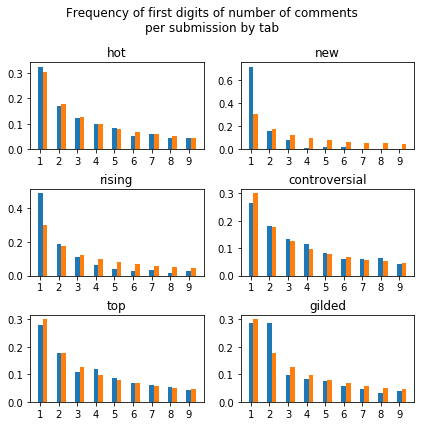 Some time ago, I was playing with Reddit’s API and wrote about generating new Reddit comments from existing ones using Markov chains. 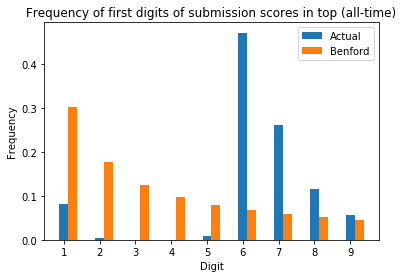 This time, I decided to test if the scores and number of comments on Reddit submissions were consistent with Benford’s law. 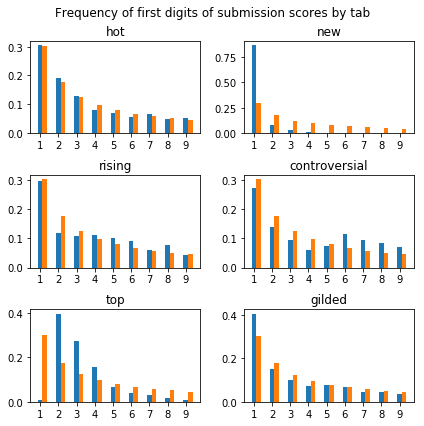 I based my analysis on the current Reddit submissions in r/all across the 6 available categories: hot, new, rising, controversial, top and gilded, downloaded fresh from the Reddit API using PRAW, so running the same analysis again will use different data and possibly give different results. 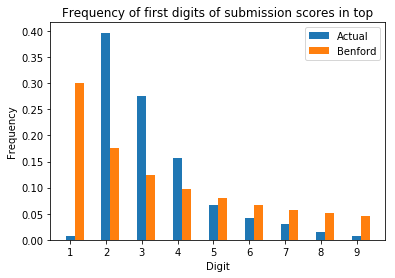 Nevertheless, you can find the code and data I used for the analysis in this blog post in the appendix. 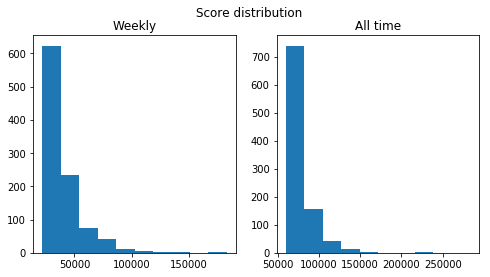 Size: Reddit monthly dumps are quite big, around 2 to 3 gigabytes per month since 2016. Far from impossible to handle, but slightly inconvenient. Submissions from the “new” tab have a disproportionate amount of leading 1s. 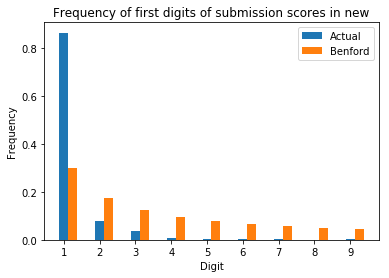 This probably has something to do with new submissions starting out with a score of 1, and 0 comments. This time, it seems to be shifted until the most common digit is 6 instead of 1! So it just happens that most of the top submissions have scores starting with 2 for the week and 6 for all time. 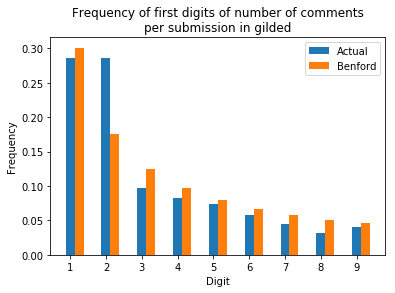 Finally, the frequency of 1 and 2 as a first digit for the number of comments on gilded submissions are similar. I don’t have an explanation for this though.